Shining 3D was founded in 2004 and successfully got listed in OTC stock market on August 8, 2014, becoming China's first OTC stock in 3D digitizing and 3D printing industry.Einstart-S desktop 3D printer, developed by Shining3D. It is the second generation desktop 3D printer of Shining3D. 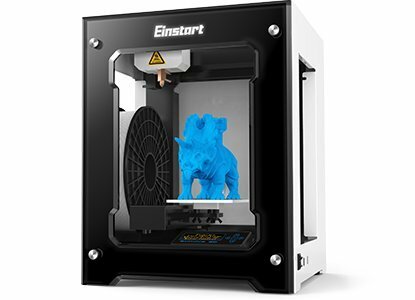 Einstart-S is designed for home or research institute use, features in easy operation, unique one-press printing design, meets all the needs of 3D printing. Any user can operate the printer within 10 minutes and print the first 3D model to have fun. Axis Runn Easy to use no PC connection needed. Full metal framework ensures high print quality. Pre-assembled. Support .stl file from all design software. Support all 3rd party 1.75mm PLA filament. Non toxic filament, protected print head, safe for open environment usage. No calibration needed. Smart Control Software offers print pause, filament change, temperature/ sprint speed adjust. Comprehensive customer support, Regular Firmware/ control software Upgrade. Mature user community.